IPAs are a big deal. Or maybe there are so many of them now that it’s the opposite—that they’ve become invisible, lost in the sea of those endless rows of tap handles. The point is that there are a lot of them, different and varied, and usually more than one per brewery. It’s a lot harder to make a standout nowadays. 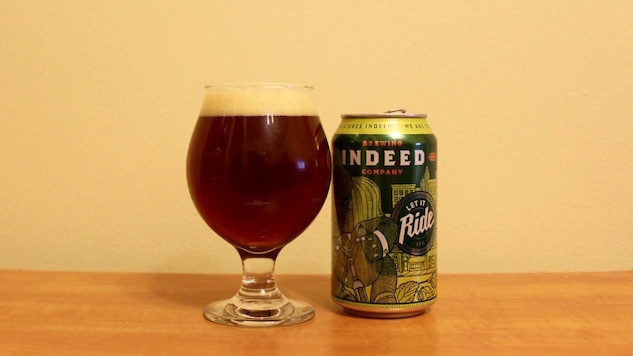 Let It Ride is the spring-summer IPA from Indeed, a warm weather partner to fall-winter’s Let It Roll. It’s a way for the brand with bicycles on their flagship cans to let everyone know that it’s time to hit the streets again, to live and breathe fresh air. So along with the spring comes Let It Ride IPA, a copper and surprisingly dark in pour IPA with a nice frothy head. Let It Ride lives on the aromatic impression it creates: it’s green and bold, a blend of Mosaic, Calypso, and El Dorado hops that produce a hint of fruity and a lot of spring freshness, all of which is grounded by a touch of earthy malt at the core. Indeed likes their hops powerful and bitter, and that’s showcased with Let It Ride. It has a hint of the dryness of their Day Tripper pale ale, but Let It Ride is smoother, with less pine resin and softer on the tongue. It uses a mid-carbonation level that accents the recipe. It’s “hoppy” as they say, but without annihilating the nuance. Meanwhile, its body is oily, fresh, and green in flavor while the finish is acidic and bitter, biting but with an easy-going mouthfeel. This has all the flavor of a whopper big beer, but the sensibility of something you could drink every day. It’s potent but accessible, and it exudes freshness at a time in the year when it’s needed most.